Earth Dave: Who's Laughing Now? In September of 2011, DC Comics relaunched its entire super-hero comic book line with all-new #1 issues. 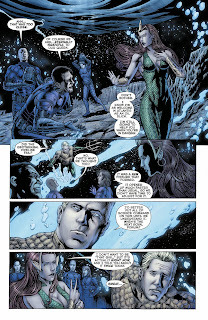 Including Aquaman #1, by Geoff Johns and Ivan Reis. Despite criticism, Johns has a pretty good grasp of super-hero comics. He was an assistant to Richard Donner, director of the 1978 Superman film. He first created Stargirl for DC Comics an homage to his late sister. He took over JSA with fellow screenwriter he David Goyer from James Robinson. He wrote Teen Titans and the event comics Infinite Crisis and 52. He rebooted Green Lantern, bringing fan-favorite, Hal Jordan back from the dead. Jordan had gone rogue, becoming the villain Parallax, and sacrificed himself in the Final Night event. On the heels of Green Lantern: Rebirth, Johns brought fan-favorite Barry Allen back from the dead in The Flash: Rebirth. Allen's return came after a quarter century of being "away" from comics, having sacrificed himself to save the universe in the landmark 1985 Crisis on Infinite Earths event. Both Jordan and Allen enjoyed a reunion in the spotlight in the Green Lantern comic event Blackest Night. Fellow Justice Leaguer, Aquaman was one of the many "zombie" super-heroes brought back to life as Black Lanterns during Blackest Night; and later given new lease on life in the sequel, Brightest Day. Johns and Reis rebooted sea king Arthur Curry with the September 2011 Aquaman #1. Aquaman has been a comic book punchline for awhile. He was pretty much defined by his weakness rather than his strengths. For the longest time he was considered a fish out of water. His one main strength was that he could communicate with sea life. Johns made some jokes about him being a cannibal by eating in a seafood restaurant; and poked fun about basic perceptions and misconceptions about Aquaman. Johns even had a hand in poking fun at Aquaman with Seth Green in a DC Comics Robot Chicken Special. After twenty-five issues, plus a zero issue an annual and two Forever Evil event tie-in issues, relaunch mastermind Geoff Johns hands over Aquaman to Jeff Parker. Parker comes to Aquaman from Marvel Adventures The Avengers and Fantastic Four; X-Men: First Class; and is currently writing DC's Batman 66 web-to-print comic. The question is, Who's laughing now? 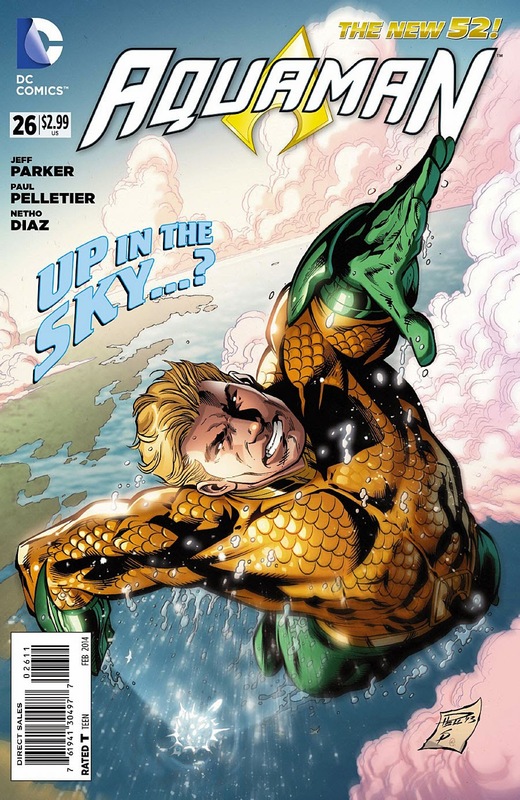 Jeff Parker and penciller Paul Pelletier take over from Geoff Johns and artist Ivan Reis with Aquaman #26. Arthur Curry's powers have been amped up. He's not handicapped by dehydration. More than just an ability to communicate with sea life, he is telepathic. Because he's an undersea hero, he's super-strong, durable and nigh-invulnerable. Here, Parker and Pelletier actually launch Aquaman into action from the start. 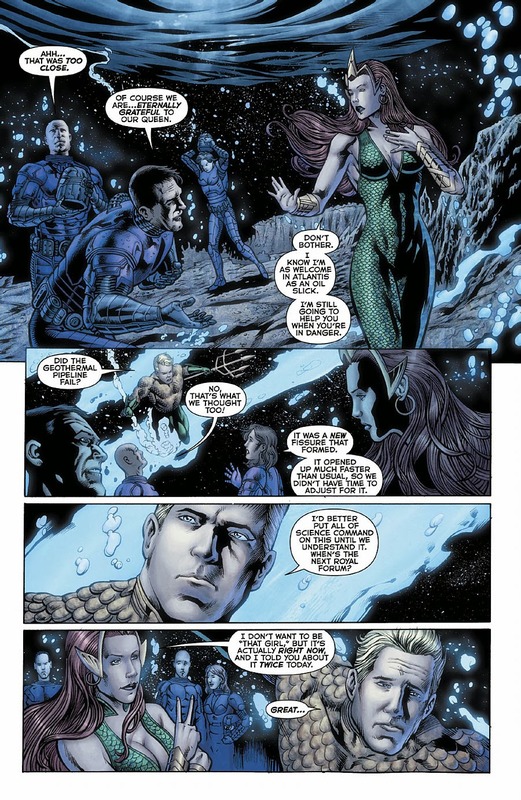 He and Mera rescue Atlantean engineers at an undersea volcanic eruption. While in the Northern Atlantic, something mysterious is discovered. An alert is sent out, and Mera rockets Aquaman from Atlantis into an encounter with a creature inspired by a either Pacific Rim or Power Rangers. Meanwhile, a mysterious figure arrives in Amnesty Bay, where Aquaman maintains a home, asking about him. 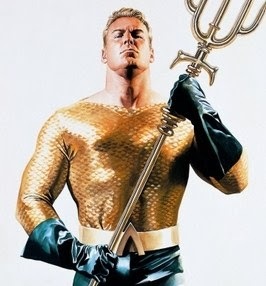 What's unusual is not that people are tight lipped or defensive, but that no one seems to be aware of Aquaman there. There's some friction going on among the Atlantis Council over Aquaman's reign. Mera acknowledges that she's "as welcome as an oil slick". The change from Reis to Pelletier is going to take some getting used to. Parker has been enjoyable on Marvel Adventures, X-Men: First Class and Batman '66. This first issue feels a bit disjointed. As if there are too many disconnected things going on that won't connect until the next issue or maybe the one after that. Parker's strength seems to be the done-in-one, self-contained stories. Here, he's stretching, reaching out with a sprawling storyline and it may be just a little too thin to start. Johns started out strong and built up to the sprawling Throne of Atlantis storyline that spread out from Aquaman to Justice League. Aquaman is still a strong character. Parker may just need to get his footing and stride down. This is a less than A+ debut from a solid writer. Disappointing, but by no means a deal-breaker. Right now, Aquaman is uncharted waters. 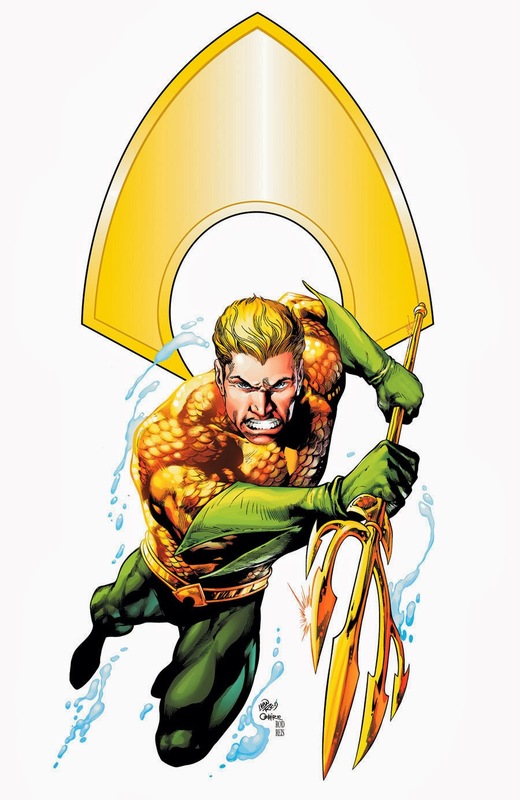 Aquaman is one of the characters that has benefited from The New 52 reset. Johns' - and now Parker's - approach to Aquaman is reminiscent of Alex Ross' and Jim Krueger's Justice Aquaman. That's good company to be in.